This post is sponsored by Viactiv. All opinions are 100% my own. Thank you for supporting brands that make Sophisticaition possible! One of my New Year’s resolutions was to be healthier, and I have been realizing throughout this year just how many things we do (or can do) daily that contribute to our overall health. 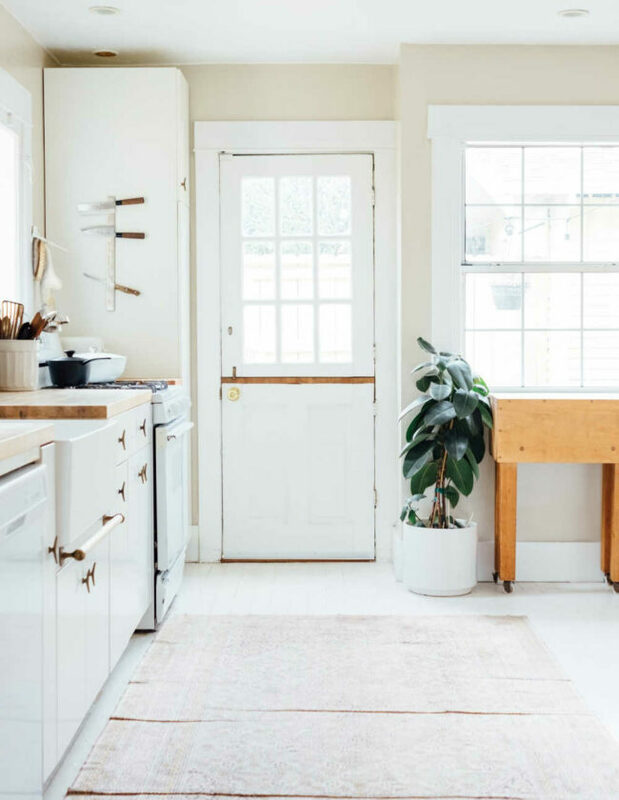 Taking the stairs instead of the elevator, opting for a tall instead of a grande at the coffee shop – little actions can have a big impact overall! That’s why I am so excited to partner with Viactiv to share an easy yet oh-so important action that can really affect your overall health. Just by taking Viactiv Digestive Health each day, you can help impact your overall gut health! A little background info for those of you who are probably thinking, why does my gut health matter? Your gut health is linked to your overall well-being, something I didn’t really understand before talking to medical professionals in my family who urged I take a probiotic-derived supplement to help balance my gut out. I was like you – I didn’t quite grasp the big deal about the bacteria floating inside my body. I have since done research, and I have found that your gut health can affect your memory, mood, skin, and more. The bacteria in your gut are responsible for your digestion of food, vitamin and mineral absorbency, hormone regulation, etc. Basically, if you are not paying attention to your gut health, you are doing yourself a disservice. 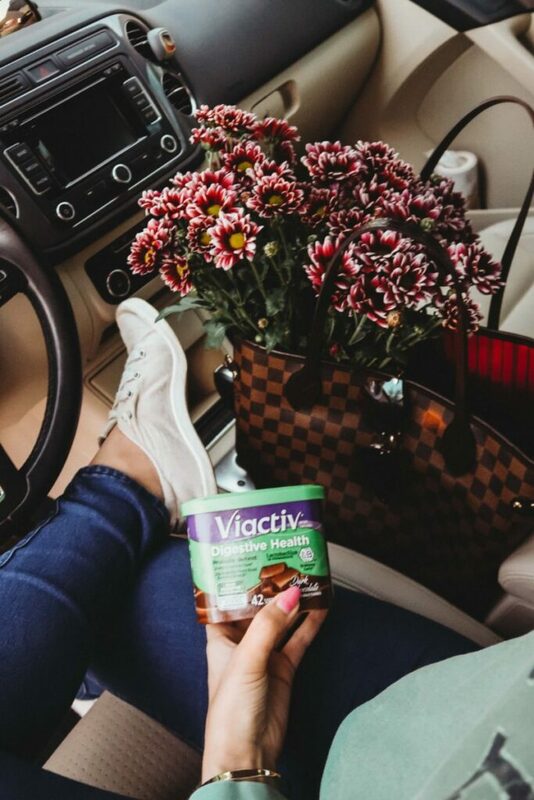 Viactiv Digestive Health is a probiotic-derived dark chocolate soft chew containing 10 billion cells of heat-stabilized Lactobacillus bacteria to fight the bad bacteria and prebiotic fiber to feed the good. I tried the delicious dark chocolate chews for two weeks to see if I noticed any changes in my body and let y’all know my honest thoughts. Let me note that I have tried other probiotic products before since my mom and uncle are in the medical industry, so I have seen firsthand that some work really well for me and some have fallen flat (everyone is different). Recently, I have been searching for a new probiotic-derived supplement since I have made some positive diet changes lately and the one I used to take didn’t really have the same effect on me, so the opportunity to try Viactiv Digestive Health couldn’t have come at a better time. The first thing I noticed that was different about Viactiv Digestive Health was the packaging. 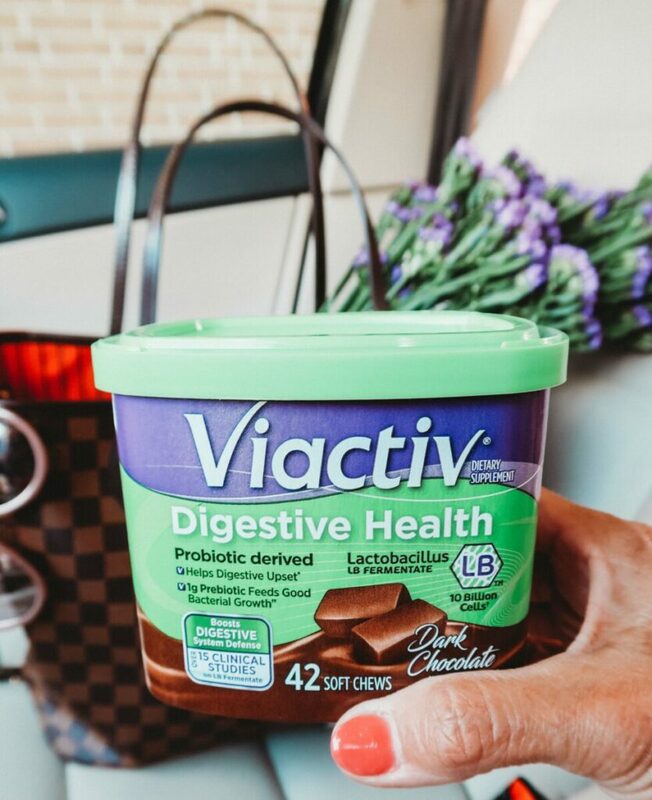 Most probiotics are pills that need to be kept in the fridge, but Viactiv Digestive Health comes in little individually wrapped chews that are dark chocolate flavored – to me, it tasted sort of like a Tootsie Roll. Also, these soft chews do NOT have to be kept in the fridge, which is so much more conducive for on-the-go people like myself. 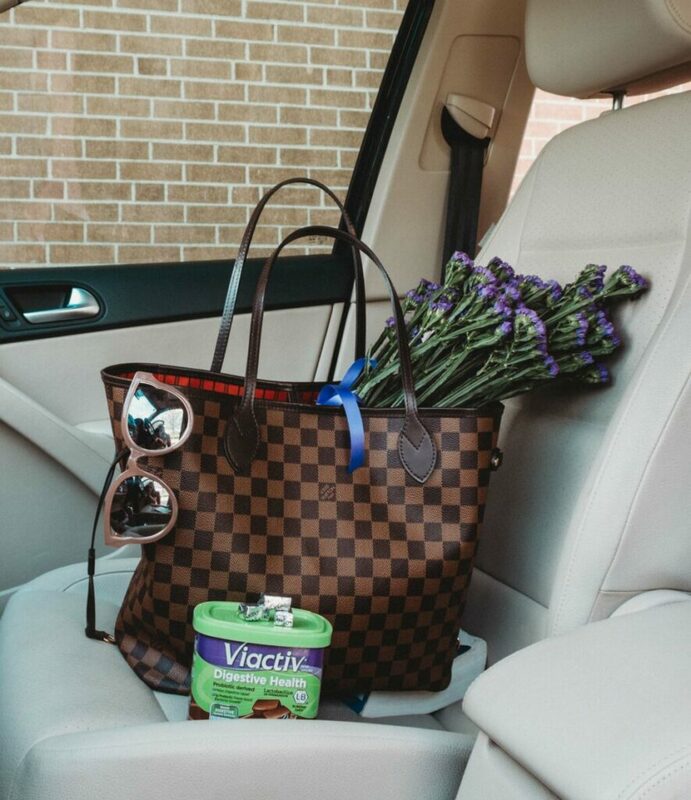 Gut health improvements can be incorporated into anyone’s routine thanks to Viactiv Digestive Health! I put these chews to the test when I came home for Nick’s graduation on Cinco de Mayo. Alcoholic beverages really make me bloated and can have a negative impact on the good bacteria in your intestines, and I was hoping that Viactiv Digestive Health would help to assist my body in processing the margaritas I was inevitably going to be drinking at his grad party and help feed good bacteria. Some girls can wear cute crop tops when they go out – not me. I wear flowy tops and dresses to hide my “drink baby” because I know how certain alcohols can affect my system. I was a few margaritas into the party and happened to pass a mirror in the hallway, and I didn’t look bloated AT ALL. I can’t tell you how refreshing it was, and how amazing I felt! When you’re bloated, you feel gross and want to hide, and thank goodness I was able to feel great throughout the entire grad party. Over the last couple weeks, I have noticed that Viactiv Digestive Health has kept me feeling good, minimizing any bloating (for me personally) or digestive issues. I have also felt a lot more energy and have been able to cut back on my caffeine intake, which has been so cool. 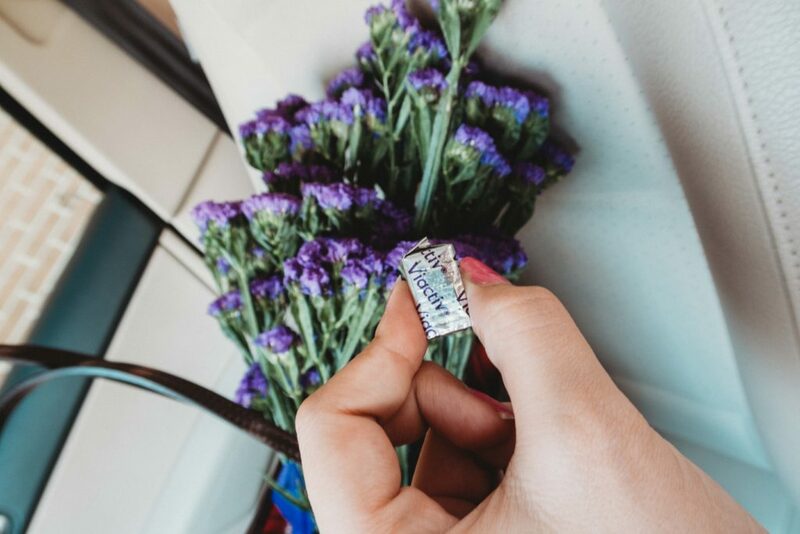 I’m really pleased with Viactiv Digestive Health, not only for how it helped me feel, but for how easy it is to use since it can go ANYWHERE with you! To try Viactiv Digestive Health, order on Amazon here or check your local Rite Aid. Let me know how you like it if you try it out!